Women on a Mission: Mom Edition: Prevent Canker Sores! Do you guys get those painful canker sores inside your mouths sometimes? I used to. It occurred to me that I should tell you how I stopped getting them. It's just something little, but if I can help you guys out with my fount of knowledge, I'm duty bound. I used to get them frequently - canker sores are the kind inside your mouth, not the ones on your lip - those are cold sores - different beasts. When I would get them, I would be in total agony. If you have them, you know what I mean, it would hurt to even talk if the sore rubbed up against your teeth just so. I once left work, mid-stride - to walk over to the nearby pharmacy and find a painkiller - a good one is called Cank-aid - it covers it like a liquid bandage, but in your mouth. I asked my dentist and he said they're usually caused by an irritation to the tissues in your mouth - like acids from tomatoes in the summer. And also, there is a pointless ingredient in toothpaste that's added to make it foamy that can cause them [canker sore irritations], it's called SODIUM LAURYL SULFATE. Why don't you try to find a toothpaste without that? So I went on a hunt. 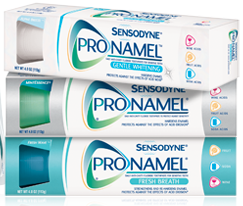 I only found one toothpaste in all of Target/Walgreens/any pharmacy anywhere - Sensodyne Pronamel - that doesn't have the nasty ingredient. It's $4-5 per tube, but I can often find $1 off coupons. Right now, I have the white cap one. Easy Mac uses it too. And guess what? I've only had one canker sore in the two years since my dentist told me this, and that was from accidentally biting my cheek [out came the Cank-aid]. The Sensodyne is totally worth the money, and it still foams up when I brush, so I really don't know what difference the sodium laurel sulfate makes in other toothpastes anyway. It's one of those inactive ingredients. It's possibly a conspiracy against Americans. I might have to take this up with my Congressional representatives. *This is not a paid endorsement of Sensodyne. I wish. I just thought you'd like to know.